The culinary development team at Domino's spent 2 years of trial-and-error testing to create a new version of the chain's original signature crust. The end result was a more flavorful crust with a top secret garlic spread brushed on after the pizza baked. While hacking Domino's new pizza for my TV show I discovered several secrets for making a great home clone of the famous pizza including a cold rise for the dough and a special blend of canned tomatoes for the sauce. 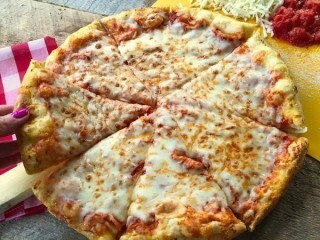 Now I've taken my recipe from the Top Secret Recipe show and tweaked it for Dr. Oz so that the finished pizza is a lower-calorie, lower-fat version the world famous Domino's cheese pie. You'll want to plan ahead for this recipe since the best way to make commercial-quality dough is to let it rise very slowly in the refrigerator—2 days seems to work great. If you don't have that much time, at least let the dough rise overnight. And if you wan't the bottom of the crust to look just like the chain's version, find a 14-inch perforated or mesh pizza pan online or at a restaurant supply store. These pans make a huge difference in the finished product, although a standard pizza pan will also produce fine pizza. And if you have a choice, the finely shredded (fancy) mozzarella cheese works best here.